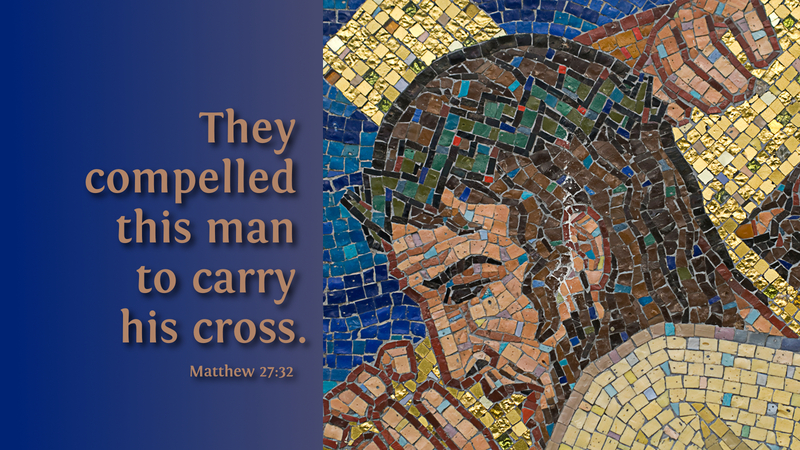 The soldiers of the governor compelled Simon of Cyrene to carry the cross of Jesus. Compel means to press into service. When one is pressed into service, one does not necessarily know the perimeters—assignment, duration, steps to completion—all circumstances may be invisible or indiscernible to the server. The soldiers in our lives may mock our Lord, jeering in disbelief, or demand that God work on their time tables. As followers of Jesus, we are compelled to deal with those soldiers as well. The ability to follow Jesus requires that we experience discomfort or suffering—cross-bearing. Globally, Christians are suffering for their faith, with many paying the ultimate sacrifice. We are grateful for God’s grace and provision, but few understand that suffering and being pressed into service are integral parts of the Christian faith and life. Fewer still would be willing to die for their belief in Jesus Christ. Cross-bearing is never convenient, painless, or without struggle. Yet, our loving Savior commands us to take up our cross and follow. Prayer: God of eternal salvation, forgive us when we desire to be served rather than to serve, and give us the fortitude and strength to faithfully take up our cross and follow. Amen. Today’s devotion was written by Tonya Brittain, Pastor of First English Lutheran Church, Marysville, OH.